I occasionally see Smoky Mountain New’s Garrett K. Woodward’s Facebook posts about hitting the trails around WNC for a mind-clearing run and my knees twinge with the memories of similar sorties and the sad recognition that without surgery those days are lost. But, recently, in dire need of some mind cleansing I jumped in my Rav4 and pointed it toward Richland Balsam on the Blue Ridge Parkway. It was one of those hot and humid evenings where the sun plays peek-a-boo with thunderheads, mist and fog roil up from the valleys, wind turns the leaves over, shadows race up mountainsides and the light changes like a four-year-old choosing ice cream flavors. Color immediately began pervading every field of vision. Oranges shouted out from the roadsides in the form of flame azaleas – some fading – some still deep in radiant glow joined by impatient Turk’s-cap lilies that could wait no longer. Red fire pinks could be seen still blazing here and there from the green shoulders. Bright yellow primrose as well as lavender and white phlox also played as the shadows danced with the sunlight. But the biggest display was undoubtedly the mountain laurel, Kalmia latifolia and it was in its glory. It could be found in every stage of flower – from dense rosy pink buds waiting to burst to spent creamy yellow blossoms ready to give up the ghost. It could be seen individually, in small clumps and/or dense colonies covering large areas of rocky outcroppings. And it was found in almost any size from two to three feet high to small tree size. Mountain laurel, known to some in the mountains as ivy can be found in the eastern U.S. from Maine all the way to Louisiana and Florida but it truly thrives in the acidic soil of the Southern Appalachians. Individual flowers are about an inch across, usually white, sometimes pale to rosy pink with dark rose-colored spots inside – they are found in dense fist-sized clusters (corymbs) at the ends of the branches. The Cherokee called mountain laurel spoonwood, as they used the wood for making spoons. But it should be noted that all parts of the plant – flowers, leaves, branches, etc. – are highly toxic. Mountain laurel is monoecious, meaning there are male (staminate) and female (pistillate) flowers on the same plant. It has a rather unique strategy when it comes to pollination. The stamens are bent and as they grow, a spring-like tension is created. When a pollinating insect (quite often a bumblebee) lands on a blossom, it triggers the release of the stamen, which catapults its pollen onto the insect. When the insect visits a female flower the pollen is rubbed off on the pistil. Mountain laurel also spreads by underground rhizomes. 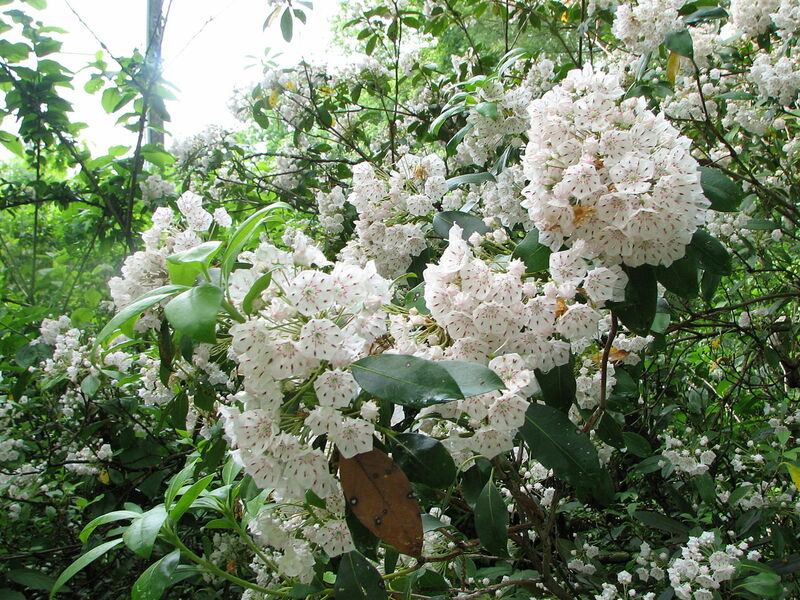 In the “did you know” department, mountain laurel is the state flower of Pennsylvania and Connecticut. It was adopted in Pennsylvania by Governor Gifford Pinchot – yes that Pinchot of Biltmore and U.S. Forest Service fame – in 1933. The mountain laurel; the light show; the other wildflowers; the cool mountain air all worked their magic – when I nosed around at Richland Balsam and headed home the load was somehow lighter – sometimes the best cure for inside clutter is outside space.